Noted singer Shahnaz Rahmatuallah passed away in the early hours of Sunday. She was 67. Shahnaz Rahmatullah, known as the queen of modern Bangla music having an illustrious career spanning over decades, breathed her last at her Baridhara residence around 1:30am after suffering a major cardiac arrest, said lyricist Shafiq Tuhin in a press release issued on Sunday. She left behind her husband, a son and a daughter and a host of relatives, well-wishers and thousands of fans to mourn her death. 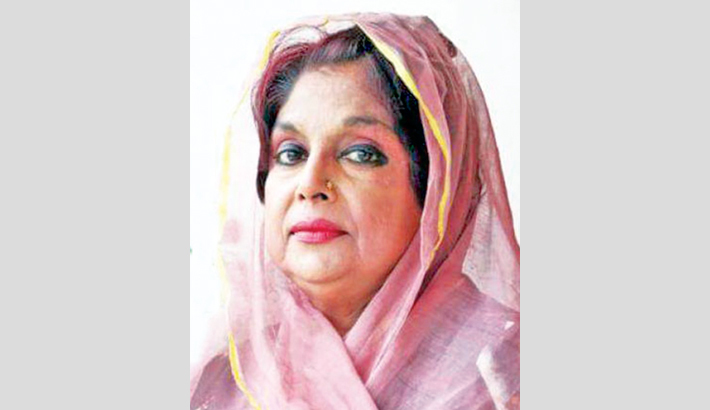 Prime Minister Sheikh Hasina expressed her deep shock at the death of the eminent singer. In a condolence message, the prime minister recalled the outstanding contributions of Shahnaz Rahmatullah to the musical arena of the country. She prayed for eternal peace of the departed soul and conveyed her profound sympathy to the bereaved family. The late singer was laid to eternal rest at Banani Military Graveyard in the capital on Sunday. Before her burial, a namaz-e-janaza was held at the ‘Park Mosque’ at Baridhara Road No- 9 after Zohr prayers. The celebrated singer’s notable songs include ‘Ekbar Jete De Na Amar Chotto Sonar Gaye’, ‘Je Chilo Drishtir Shimanay’ and ‘Ek Tara Tui Desher Kotha’. Her main areas of music entailed modern (Adhunik) and patriotic songs. She emerged as a singer in the capital in mid-1960s. In late 1960s and early 1970s, she sang many patriotic songs, including ‘Sohni Dharti Allah Rakhe’ and ‘Jeevay Jeevay Pakistan’ to inspire the freedom fighters as well as the freedom-seeking people of the country. In her illustrious career, she had playback voice in many songs for Urdu films as well as gazals in the Pakistani era. In recognition of her timeless songs, she was awarded Ekushey Padak in 1992, National Film Award for Best Female Playback Singer for the film ‘Chhutir Phande’ in 1990, Bangladesh Shilpakala Award and many more. Shahnaz Rahmatullah was born on January 2, 1952 in Dhaka. Late actor Zafar Iqbal and late music director Anwar Parvez were her brothers.